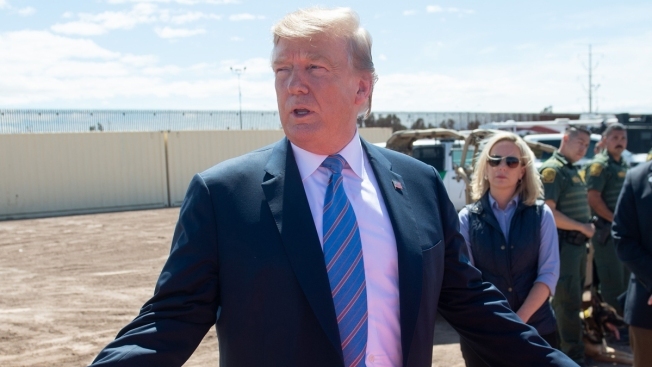 President Donald Trump speaks with members of the U.S. Customs and Border Protection as he tours the border wall between the United States and Mexico in Calexico, California, on Friday, April 5, 2019. President Donald Trump has for months urged his administration to reinstate large-scale separation of migrant families crossing the border, three U.S. officials with knowledge of meetings at the White House told NBC News. Kirstjen Nielsen, Trump's outgoing Homeland Security Secretary, resisted, setting her at odds with the president. According to two of the sources, Nielsen told Trump that federal court orders prohibited the Department of Homeland Security from reinstating the policy and that he would be reversing his own executive order from June that ended family separation. Kirstjin Nielsen resigned as the secretary of the Department of Homeland Security on Sunday, marking an end to her controversial era at the helm of a department that oversaw migrant families separated at the border and a rising number of apprehensions at the U.S.-Mexico border. Nielsen has held the post since December 2017.